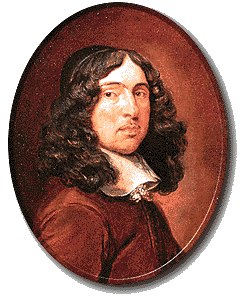 Andrew Marvell (March 31, 1621 – August 16, 1678) was an English metaphysical poet, who was largely ignored during his lifetime. He rose to prominence over the centuries and is now considered to be one of the most remarkable poets of the seventeenth century. Marvell's reputation was overshadowed for a long time by his revolutionary politics, which included a stint as a parliamentarian. Most of his verse, unfortunately, consists of satires written for political ends, and suffers as a result. His lyric poetry, however, unfortunately took no subject but himself. While the result consists of beautiful, effortless, flowing verses that roll off the tongue and through the mind with an ease unequaled among poets of his era, his writings offer little to the beauty of the world in which we live. Marvell was born in Winestead-in-Holderness, Yorkshire, to Rev. Andrew Marvell, an Anglican priest. All that is known of his mother is her name, Anne. When Marvell was three years old the family moved to Hull, where his father took up a post as a lecturer at Holy Trinity Church. As a young man, Marvell was educated at the local grammar school, where he received high marks for his verse and even published two early poems, one written in Greek, the other in Latin in a volume titled Musa Cantabrigiensis. Marvell went on to attend Trinity College, Cambridge, where he received a full scholarship, within a year earning his Bachelor of Arts degree. A year into his enrollment, Marvell's mother passed away. He remained as a scholar at Cambridge for a few more years until he was forced to move for financial reasons following his father’s accidental drowning in 1640. It is unclear what Marvell did in the years following his departure from Cambridge. He may have worked as a clerk at his brother-in-law's trading house for two years. At some point in 1642 Marvell went on the Grand Tour, visiting France, Holland, Switzerland, Spain, and Italy. This turned out to be a fortuitous move, because while Marvell was on the continent England became embroiled in the English Civil War from 1642 to 1647. During this time the reigning king, Charles I was imprisoned and then executed by vote of the parliament, who in turn elected a general, Thomas Fairfax, to the executive command of the English Commonwealth. When Marvell returned, he found work as a tutor to the daughter of Fairfax, who had recently given command of the Parliamentary army to Oliver Cromwell. During his three years as tutor to Mary Fairfax, Marvell composed almost all of his most important poems, drawing on the vivid experiences he had abroad and also on a powerful romantic longing, the object of which may have been none other than his student, Mary Fairfax. To arch the Brows that on them gaz'd. Their Bodies measure out their Place. Demands more room alive then dead. Where Winds as he themselves may lose. Though the first Builders fail'd in Height? In 1653 Marvell befriended the revolutionary poet, John Milton. During his time abroad Marvell had been a supporter of Charles I and had opposed the English revolution and the rise of the Commonwealth, but with Milton's help he gradually became a staunch advocate of the revolution and the rule of parliament. Milton wrote a glowing recommendation that Marvell be appointed to the post of Assistant Latin Secretary to Cromwell's Council of State, a post which he secured in 1657. In the same year he became a tutor to Cromwell's nephew, William Dutton. In 1659 he was elected to Parliament from his hometown of Hull in Yorkshire, a post he held until his death. In 1660 the Commonwealth collapsed, Cromwell was executed, and the monarchy was restored by the return of King Charles' son, Charles II, from exile. During this time of upheaval, Marvell, in his quiet way, demonstrated his skill at political maneuvering; he not only avoided all punishment for his cooperation with republicanism but also helped convince the government of Charles II not to execute Milton for his antimonarchical writings and revolutionary activities. From 1659 until his death, Marvell was a conscientious member of Parliament, answering letters from his constituents and going on two diplomatic missions, one to Holland and the other to Russia. He also wrote prose satires anonymously criticizing the monarchy, defending Puritan dissenters, and denouncing censorship. He is sometimes known as the "British Aristides" for his incorruptible integrity in life and poverty at death. The life and work of Andrew Marvell are both marked by extraordinary variety and range. Gifted with a most subtle and introspective imagination, he turned his talents in mid-career from incomparable lyric explorations of the inner life to panegyric and satiric poems on the men and issues involved in one of England's most crucial political epochs. The century which followed Marvell's death remembered him almost exclusively as a politician and pamphleteer. Succeeding periods, on the other hand, have all but lost the public figure in the haunting recesses of his lyric poems. Like John Donne, Marvell exhibits a mastery of extended metaphor. Consider the long metaphor of "time enough" sustained through the allusions to "the Flood," "the conversion of the Jews," and the "vegetable love" growing "vaster than empires"; or the metaphor of devouring sustained through the "amorous birds of prey" and time's languishing "slow-chapt power." In addition to this, however, Marvell, perhaps more than any of the other Metaphysical poets, exhibits an easiness of tone that is difficult to analyze but obvious to see: a poem like “To His Coy Mistress” reads so easily it almost doesn't seem like a poem. The ease in which each rhyme moves into the next is a testament to Marvell's virtuosity as a poet, even if he did not develop any particular new techniques but simply improved upon existing ones. Marvell was a member of the Metaphysical school, and in contrast to Herbert's brusqueness and Donne's intellect, Marvell stands out as the most movingly lyric poet of his period. All links retrieved November 18, 2016. This page was last modified on 18 November 2016, at 20:17.